One of the most important strategic issues IT decisionmakers face is how to best leverage the rapidly evolving cloud resources available today. Those who make the right move could substantially improve the efficiency, reliability and flexibility with which they deliver critical IT services to their internal and external users. 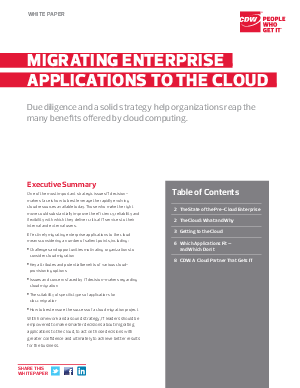 With homework and a sound strategy, IT leaders should be empowered to make smarter decisions about migrating applications to the cloud, to act on those decisions with greater confidence and ultimately to achieve better results for the business.